A full installation in a box compromising of SLICK A1 amplifier, SLICK SLR enclosure, SLICK 6c9’s and all the cables necessary. 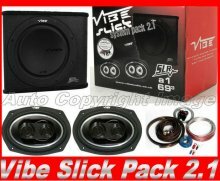 The Slick 2.1 Pack is perfect if you are looking for a quick and easy way to greatly improve your car’s audio installation. The SLICK A1 is only available as part of the 2.1 pack. Minimum Input: 200w RMS . RMS @ 4 Ohm Stereo: 2 x 100w. RMS @ 2 Ohm Stereo: 2 x 160w. RMS @ 4 Ohm Mono: 1 x 325w. Crossover Range: 45 - 300 Hz. Speaker Size: 6" x 9". Mounting Diameter: 220 x 150 mm. Magnet Size: 100 x 18mm. Recommended Amplifiers: SLICK a2/a3/a4 BlackBox STEREO 2 / 4. The VIBE 3000watt BASS KIT is specifically designed to gain maximum output from high power BASS systems. Featuring the best BASS specific cables from the VIBE CriticalLinkTM Range. VIBE 140 amp circuit breaker The VIBE circuit breaker is rated at a massive 140 amps and offers critical protection to your system ­ if the system over powers or short circuits the breaker will cut in and save your equipment. All cable is terminated with crimped terminal rings in place and accessory fitting kit. This kit is compatible with the majority of amplifiers on the market ­ VIBE recommends this kit for all VIBE BASS monoblock amplifiers new, current and old models. Model: Bass system Kit ­ Bass specific amplifier wiring kit.